- If you already have a bracelet of the desired size, lay it on a smooth surface and measure it with a ruler or a measuring tape from one end to the other, including the closure. - Take note of the length and choose the Nomination bracelet that best matches that length. You can use our measuring tool to measure the circumference of your wrist. Remember to select print at 100% (Do not resize page). If you are undecided between two sizes, we recommend you choose the larger. This way if the bracelet is too big then you can simply remove one of the links to make it the perfect size. You can easily add and remove links on your Composable bracelet on your own, thanks to the special mechanism that holds the links together. 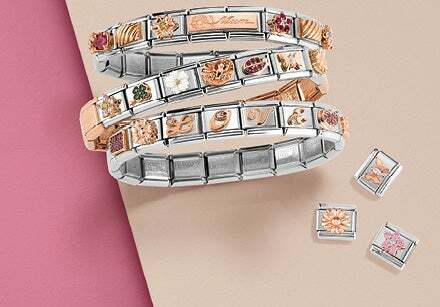 After you’ve chosen the bracelet in the Create your bracelet section of our site, you can personalise it with Composable links, choosing from the vast assortment of symbols and designs. Remember that each link with the symbols that you choose will take the place of one of the empty links on the base bracelet. You will personalize your bracelet but the length will be the one you chose at the beginning of the process. If you have questions or doubts about how to create your bracelet, read our FAQ. Some of our bracelets are made in natural leather, which is naturally elastic and therefore these bracelets might stretch slightly over time if worn for long periods of time. The colourful bracelets from the MyBonBons and Cubiamo collections have the original knot and loop closure that allows to adjust the bracelet to your wrist. Bracelets are available in two different lengths: 26 cm and 60 cm (can be wrapped three times around the wrist). Bracelets from the Extension Collection are stretchable and can also be made in a requested size. You can select the size that best suits you from those available on the product page of each Extension bracelet. You will receive a bracelet created just for you. The rigid bracelets in our collections are adjustable and can be adapted to your wrist. They can be tightened or stretched by 1 cm compared to the standard length on our site. The sizing of each bracelet depends on the model and the craftsmanship of the bracelet. Some bracelets have adjustable lengths thanks to the extension chain that allows to adjust bracelet length as you like. For example, a bracelet with an adjustable length of 17-19 cm allows you to adjust the length between 17 and 19 cm. 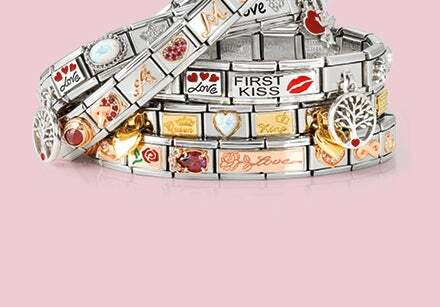 Engraved items are made-to-order and are not eligible for return. For engraved items, add an additional 20 days to the delivery time frame.